Our beautiful desert home is located in one of the most sought after neighbourhoods in South Palm Desert....Canyon Cove! 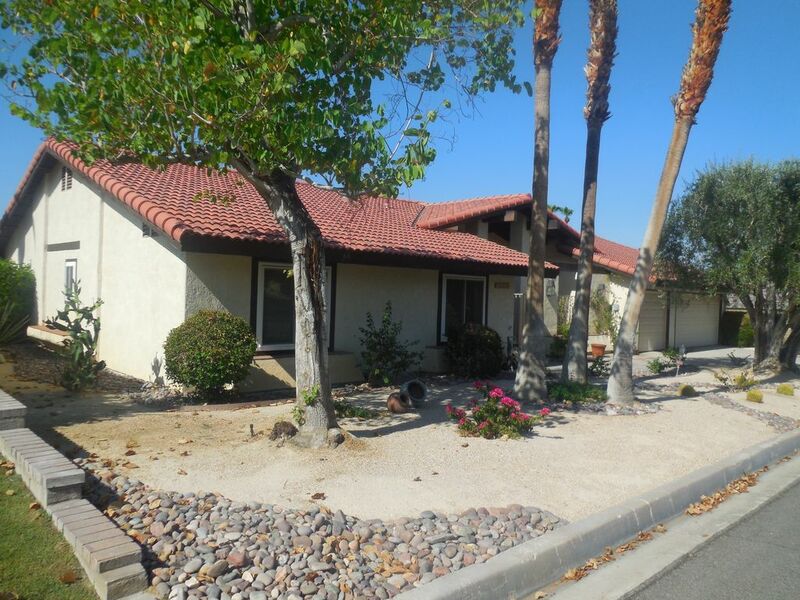 Known for its stunning mountain views, wide streets, mature landscaping, and close proximity to world famous El Paseo shops & fine dining, the Living Desert, and over 100 exceptional golf courses. This furnished 3 bedroom, 3 bathroom home features a kitchen with stainless steel appliances, beautiful sliding doors and windows that let in the gorgeous desert sun, and solar lighting tubes have been added throughout making the home very bright. The house is approximately 2,100 sq. feet and sits on a beautiful 12,200 sq. ft. lot. A private heated spa is accessible from the master suite. All our renters have access to the exclusive and private Canyon Cove heated pool, spa and sauna facilities as well as the three private tennis courts that are a short walk from the house. The house can sleep up to 8 people comfortably. We fell in love with Palm Desert several years ago while visiting family. The mountain views are breathtaking and the weather simply sublime all year round! We love to walk to the end of the street where we can access the mountain hiking trails on one side and The Living Desert Zoo on the other side. The golf opportunities are endless and shopping on El Paseo is nearby. 3 private tennis courts are available to our guests! Over 100 beautiful golf courses in the Coachella Valley! His and Hers sauna's are available at the private association pool complex down the street. Enjoy the large private association pool at the end of the street. Enjoy your private backyard spa! In one word " Fantastic"
We have been coming to Palm Desert for the past eight years and have always stayed at a golf resort. This year we opted for something different. The house is in a lovely residential neighbourhood five minutes from El Paseo. The home is large, fully equipped and very well maintained. The yard is lovely with fruit trees and a hot tub. The owners, David and Michelle bent over backwards ensuring that everything was in order. We would highly recommend this property. Stayed for a month (Nov 28 to Dec 28 2011), the property was very clean and well looked after, just the right distance from shopping and attractions to allow for privacy and yet minutes to the action. The owners went out of their way to make sure the place was set up for us (as my son and his family joined us for almost two weeks) and contacted us during our stay to make sure everything was to our satisfaction.